How many shoes do you own that you almost never wear? I know for me, it’a A LOT! Earlier this summer, I started a little shoe challenge for myself. Every day, I would make the effort to pull out a pair of shoes that I forgot about (I’m a shoe fiend) and work them into my wardrobe again. To keep track, I’d take a fast #shoefie (that’s a selfie for shoes) to document it. What happened was that since I have a tendency to dress from the shoe up, I started to come up with more varied outfits based on my footwear. 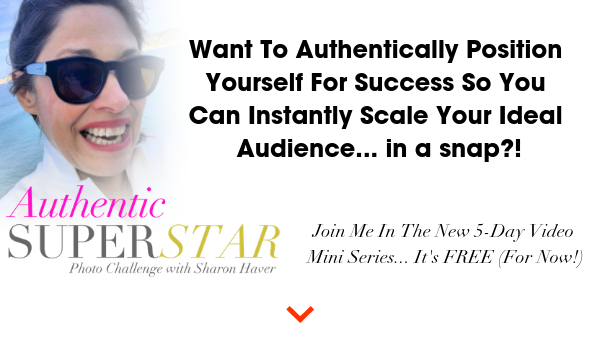 Now, mind you, as a work from home entrepreneur, I usually wear fairly casual clothes that I style up when I go out… knowing how and when to confidently style yourself together is what I teach to the ladies in the C’est Chic Crash Course). I decided that I would share a Shoefie Diary with you on my Instagram so that you can start to shop your shoe closet and in turn, create more lively and varied outfit. Heels, flats, casual shoes, sneakers… new shoes from this season… shoes from five years ago… it doesn’t matter… what matters is that you make the effort to be present in your presence and show the world what it’s like to walk in your shoes. Can you imagine? Right in the middle of a shoe challenge, I’m hobbling about in walking cast! (check the p.s. at the end of the post to see how I managed this annoying injury). Not to be undermined and no stranger to the nuisance of a cast, I can rock a heel and a cast like nobody’s business. I can even coordinate my “good foot” with the cast on my other foot, hence my Tamara Mellon gladiators, pictured right. 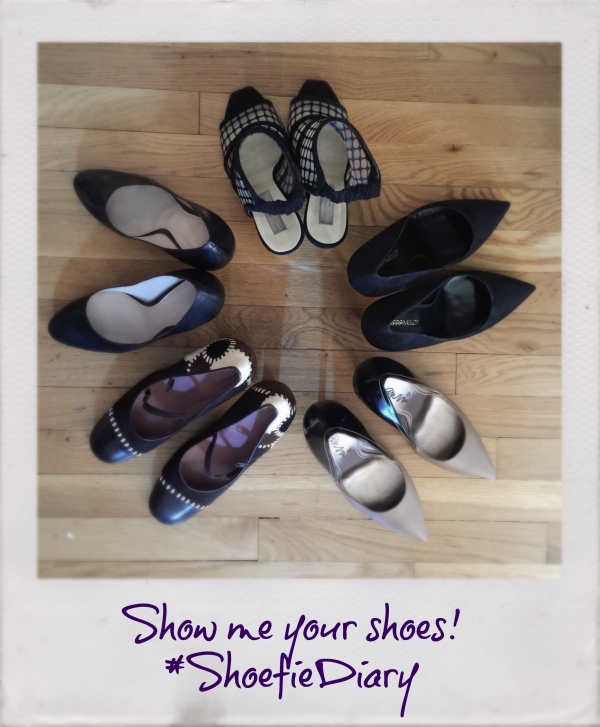 So… as I’m slowly getting close to being able to hop around I thought it would be a great time to start an END OF SUMMER SHOP YOUR SHOE CLOSET DIARY… or Instagram Shoe Challenge, if you will, with you! I encourage you to make an effort about what shoes you wear every day for the rest of the summer + take a quick snap with your phone (nothing fancy; if I can use my phone, so can you!) 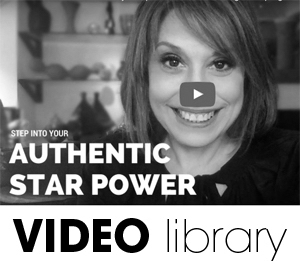 to create your personal shoe diary. Follow me on Instagram for daily prompts. 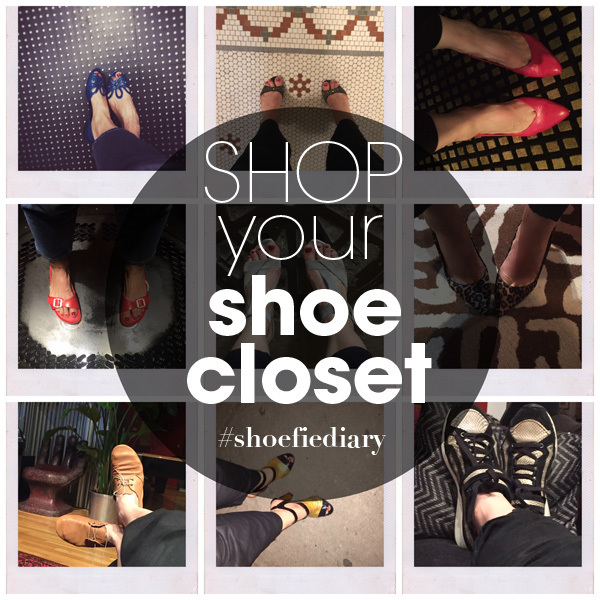 Upload your daily shoe picture to Instagram, or your social media of choice, with the hashtag #shoefiediary. 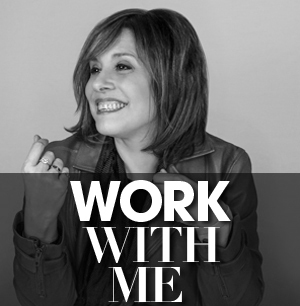 Just think of how interesting and more varied your wardrobe choices can be when you rework what you already own! Style Tip: Now, what makes this shoe challenge a bit easier for me is that I almost always shy away from trendy shoes and opt for classic, yet interesting styles, that will last several seasons and be worthy of their investment. That way, my shoe closet can grow… I warned you that I was a shoe fiend! If you’re a bit shy about showing your feet, don’t worry. As a little girl my father and I would spook my mom by hiding under the covers with only our “twin” huge and ugly feet sticking out and wait for her to shriek in horror. Maybe that’s why I like shoes so much. Who knows. Are you ready? Show me your shoes! Take a quick shot of you daily shoe. Upload your picture to your Instagram (or your social media of choice). Share the post and challenge with all your shoe-loving friends. 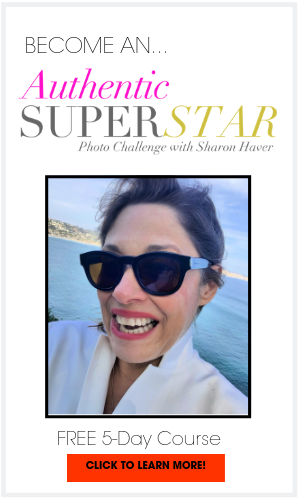 You will have daily prompts from my shoe diary on Instagram (they will be pushed to other social media as well). That’s it! Have fun with it and see how many more interesting outfits you can “shop” out of your shoe closet. 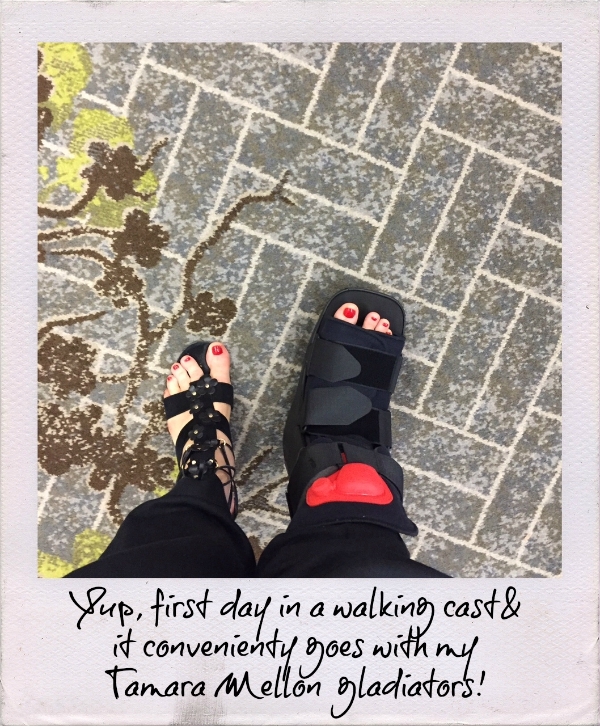 For those of you who want the dish on how I sprained my foot: I was on my to the National Speakers Association conference in Washington, D.C. when a very chivalrous gentlemen insisted on reaching for my hand as I stepped off a bus. I had my computer and electronic paraphernalia in my tote bag (it’s Hermès but with a faint macaroni salad stain leftover from when said salad’s container exploded in a Wal-Mart parking during a family road trip to Cody, Wyoming. Yes, I digress, but that meld of high/low is kinda my life). So back to the well-meaning gentlemen… I leaned forward to reach for his hand and my heavy bag swiveled to the front thus knocking me off balance, and in that twisted position, I managed to sprain my foot. Could be worse. Can’t wait for it to get better. Now show me your shoes!